Well, we’re halfway through the summer semester and I still haven’t gotten back to blogging very much. I am cooking more. In fact, I am trying to select one recipe each week from Deborah Madison’s Vegetarian Cooking for Everyone. I have had this cookbook for a couple of years and haven’t really utilized it very often. So it is a goal of mine to pick this cookbook up more often. Yes, you’re probably already celebrating, with your holiday picnics underway as I type, but this recipe would be a good one to take to a potluck or summer barbecue later this summer. And with that, I had better get off the computer and go get ready for the July 4th Extravaganza over at my friend, Heidi’s, house. I hope you’re enjoying your holiday! Cook quinoa according to directions. Allow to cool completely. 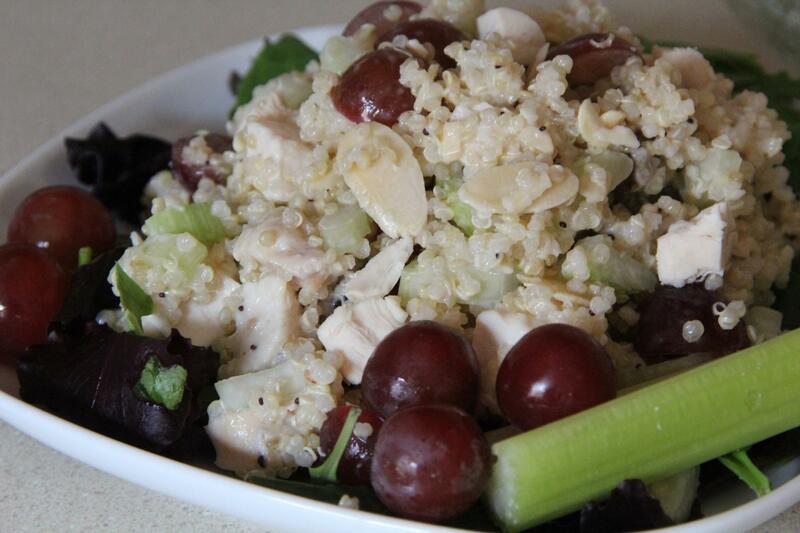 Mix together cooled quinoa, celery, grapes and chicken in a large bowl. Stir in dressing, as desired. (If your quinoa is still warm you will need more dressing as it seems to soak up more when it is warm). Mix in almonds before serving. Size up the recipe for a crowd. As written, this makes about enough for me for 3-4 lunch-sized portions. I often throw it over some mixed greens for some extra umph.